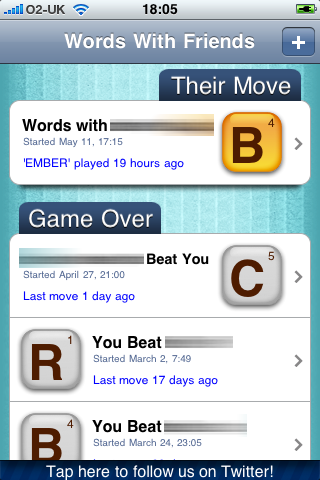 Here’s something that I spend a lot of my time on… an iPhone (and iPod Touch) app “Words with Friends”. Actually I use the free version – but as far as I can tell the only difference between the full version and the free version is the advertisements, and I can put up with those. It’s basically a Scrabble game, although different enough not to annoy the creators of Scrabble too much… for example the double/tripple score squares are in different places. But the idea is the same – each player gets a rack of seven letters and has to use those letters to create a word on the board, before taking enough tiles from the “bag” to make their rack up to seven again. 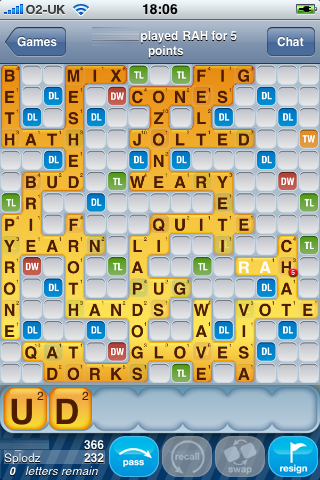 Letters have points values and the player with the most points once all the tiles have been used wins the game. Obviously there is some skill involved – quite a lot actually – as you have to be able to create words using your tiles, linking them with tiles on the board. But luck also plays its part – a wordy with rubbish letters can’t get many points. 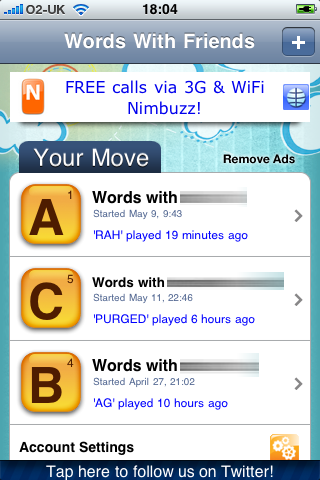 Words with Friends allows you to play Scrabble with your friends (maximum two players per game) on your iPhone or iPod Touch. It’s very easy to use – it’s intuitive like iPhone apps should be. The home screen shows you all the games you’re playing and have played recently, who’s turn it is, and when the last move was taken. 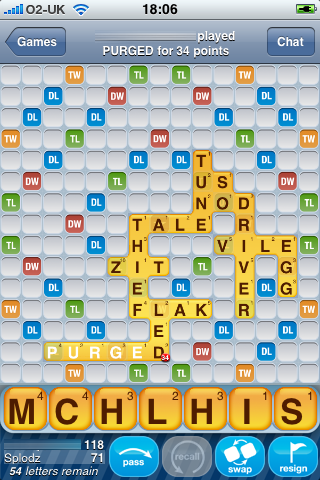 By touching on a game Words with Friends scrolls across to the board, where you can see your letters, your score etc. The most recent word placed on the board has white letters, so you can see easily where your opponent placed their tiles. To place your word on the board you simply use your finger to drag the letters where you want them to go. Double tapping on the board zooms in so you can place letters more easily. Once you are happy with your word you tap on “submit”, which first checks to see if your word is allowed (if not you get a message – you don’t have to rely on each other knowing if words are real or not! ), lets you know how many points it got, and then lets your opponent know you’ve had your go. 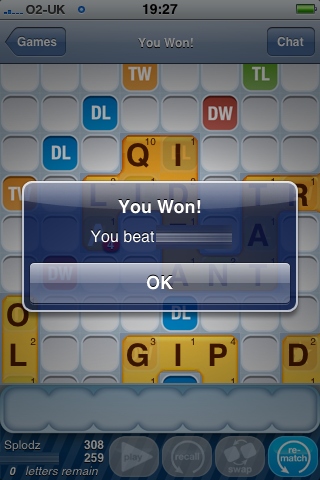 After they’ve done the same you get a push notification so even without Words with Friends open you know it’s your go. One downside I have found is sometimes the game freezes on the “submitting” page… and can take forever to sort itself out. Having said that, the most recent update may well have sorted that out for good as it hasn’t happened for a while! Apart from your letters and the board, you also have the option to pass your go or swap your tiles. 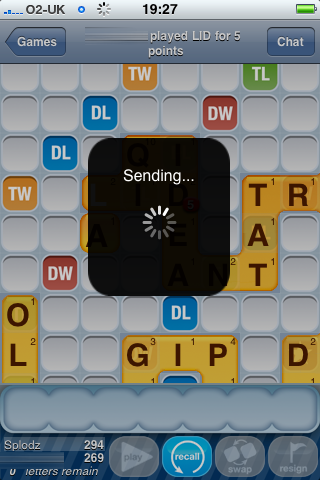 There is also a chat screen, which is great for commenting on your opponent’s choice of word, their stupidly high score, or your rubbish letters. Yay I won! This doesn't happen very often! 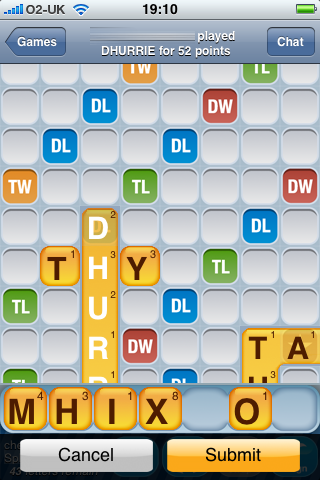 By the way my words with friends id is hihecat, wanna start a game?